While checking the starter wiring I noticed a lot of play in the passenger side tie rod end. 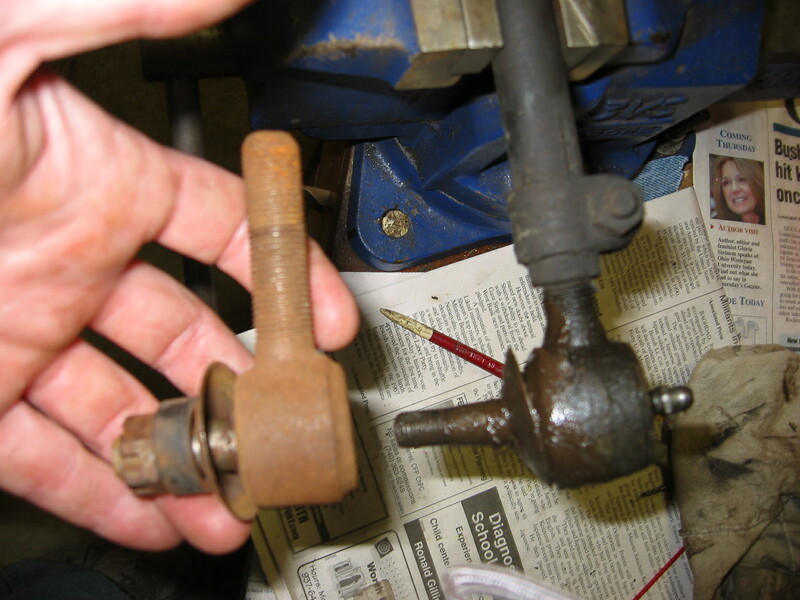 I knew it was getting badly worn so I had bought two new tie rod ends off e-Bay. The only problem is they are the wrong tie rod ends. Rats. I tried local sources but steering parts are just not carried for that car any more. So I hit the on-line vendors. 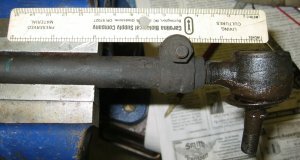 Stephen Allen Studebaker had the best price so I ordered a new tie rod end. It was here in three days and is a new part although it has quite a bit of surface rust. Beggars can’t be choosers! Step one: Remove the tie rod. 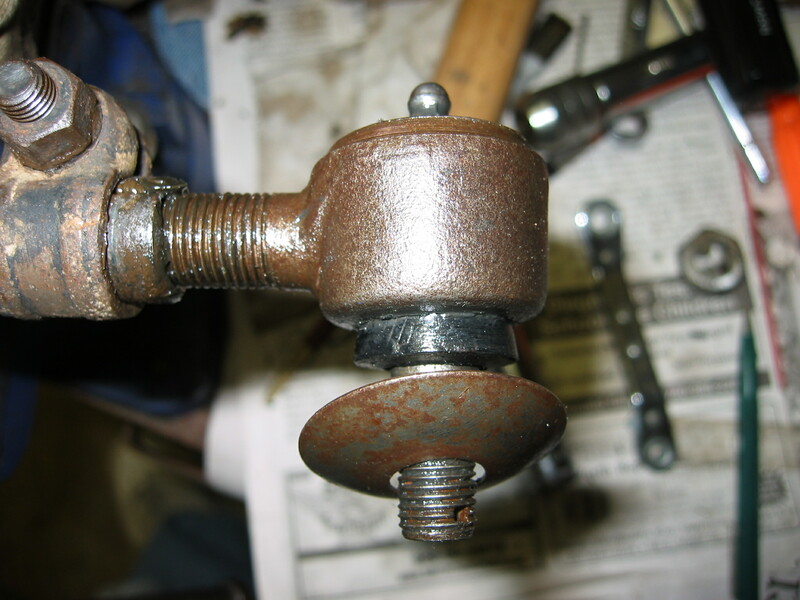 While it should be possible to change the tie rod end with the other end in place it is much easier to work on things with the tie rod on the bench. 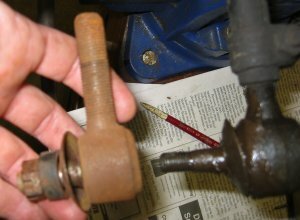 So I removed the cotter pins and loosened the nuts from both tie rod ends then used my tie-rod-popper-outer tool to break the ends loose. 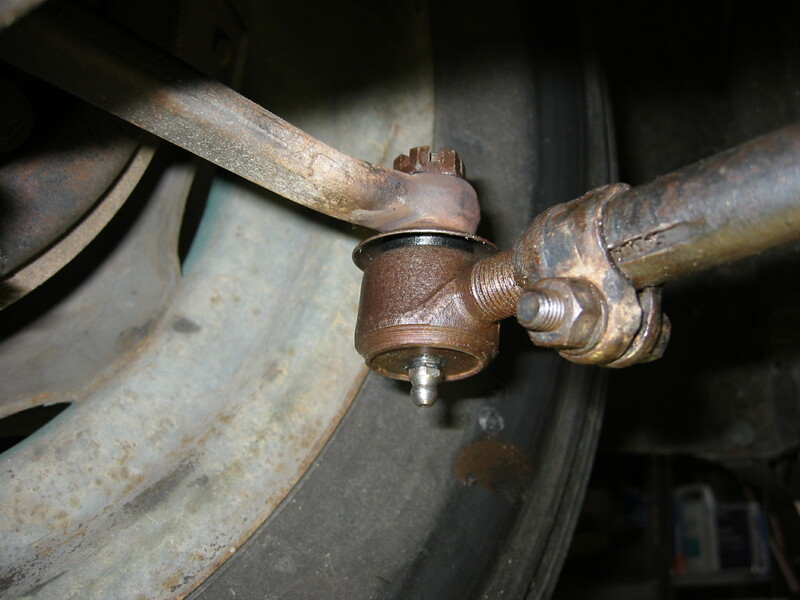 Each tie rod end has a tapered shaft that is clamped into a matching tapered hole by the pulling action of the nut. This fit is very tight and without a tool like this getting them out is a chore. I bought this tool years ago to work on my VW GTI. It was a little big but worked just fine. 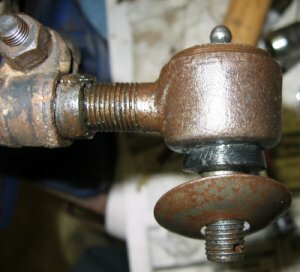 Once I had the tie rod out I clamped it in a vise and compared to the new part. Looks like a match! You can see the new end is a little rusty. I cleaned it up with a wire brush and used brake cleaner to blow out the dirt and debris from the ball joint. The grease seal (that rubber doohickey under the nut) is a little hardened with age but worlds better then the destroyed one I found on the old tie rod end. 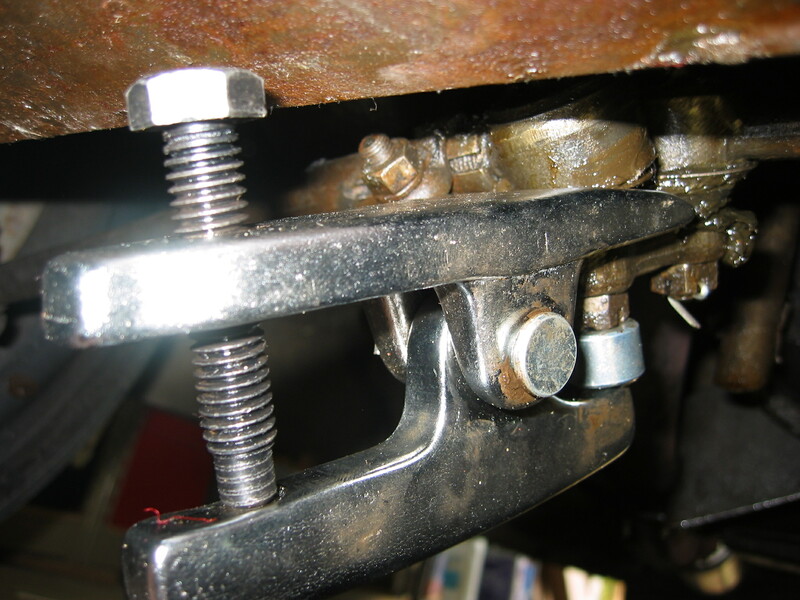 The alignment of the front wheels is adjusted by loosening the tie rod end clamp and screwing the end in and out. 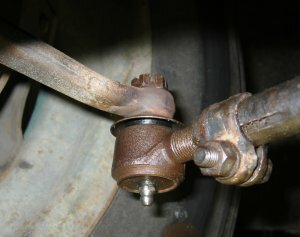 So it is vital to keep the overall length of the tie rod the same when I put the new tie rod end in. 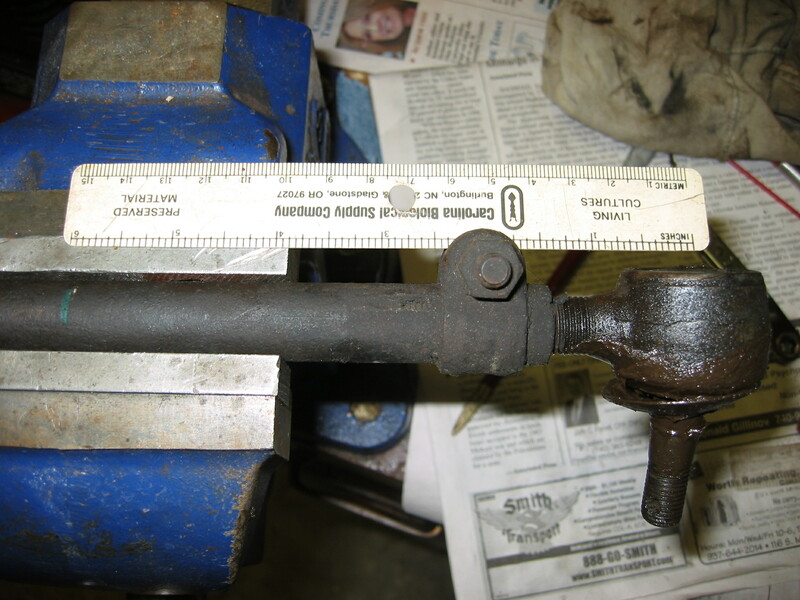 So I measured 6″ from the center of the grease fitting hole on the old tie rod end and marked the tie rod. Now I can put the new end on so it’s center is in the same place and the alignment should be fine. Speaking of grease fittings the one that was in the tie rod end was bad. 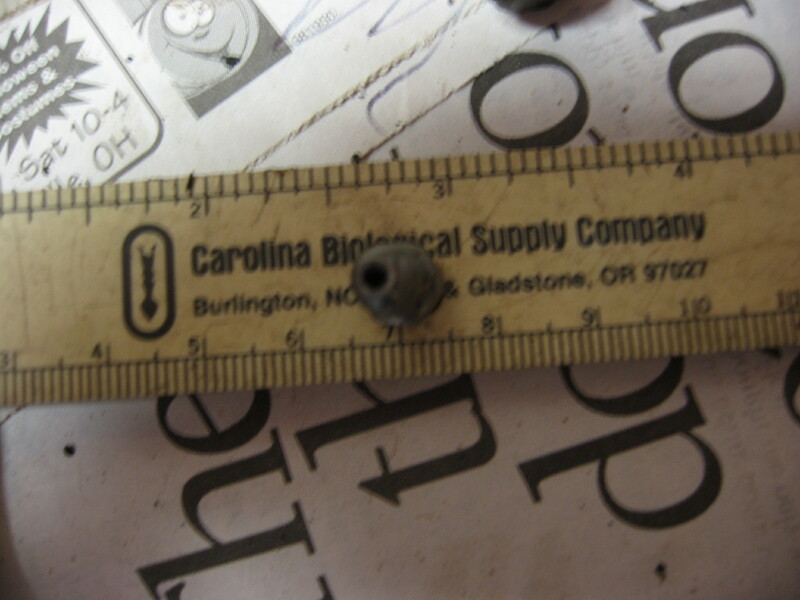 There is supposed to be a spring-loaded ball in the end of the fitting but on mine the spring and ball were just gone. The fitting was just a tube. These fittings are actually called “zerks”. I am not making this up. The local hardware store had them so I bought a couple. Problem solved. Here is the new end installed in the tie rod to the correct length with the new zerk. The grease seal is installed and it is ready to go back into the car.Re-installing was a chore. Remember the tapered hole the tie rod end fits into? Well on this tie rod end the threads seemed to stick out a few thousandths of an inch more than they should. The end would NOT fit in the hole. It was really close but no cigar. I ended up running a thread-cutting die up and down the threads then I rubbed them with emery cloth to round off the peaks on the threads a bit. After that it fit. I don’t know who made this tie rod end but they had quality issues. Here is the “end” result ready to go! Now I can just hear the masses saying: “Nathan you putz, you forgot the cotter pin! Well not quite. I have a whole box of cotter pins. I even have both sizes. Too big and too small. I had to make another hardware store run for the right size cotter pins. They have been installed and the fittings greased. The new end works great. This is the first step in getting the steering tighter! May 25 update: OK, now I can her the masses saying “Nathan you putz you put the rubber seal on the wrong side of the washer! You are correct, I sure did. Not sure what I was thinking. I have taken it apart and assembled it correctly.